(15 km E of Castlegar). (1 km S of Siwash Mountain). Club maintained cabin. Sleeps 6. Stove. Frame construction. 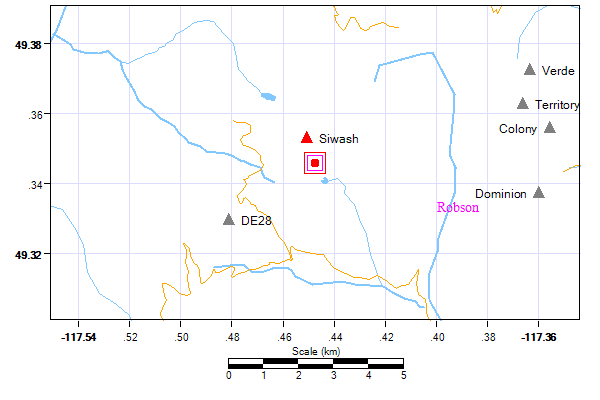 Location: (as of 2012 April) The hut is just north of the tiny tarn marked on the 1:50K map. This tarn is about 1/2 km northwest of Marble Lake. This corresponds to 49.346141,-117.44768, and an elevation of 2086m. It can be difficult to find in deep snow. Hut Description: A very nice A frame hut with upstairs sleeping loft (sleeps 4 upstairs, 2 more downstairs), wood stove, benches and tables and an outhouse. No foam pads. There is a two burner Coleman white gas stove (bring your own white gas) and lantern, as well as dishes, cutlery, pots, etc. There is a washing up tub with some detergent and bleach. Please pack all the eating utensils back in the tub to keep the critters out. You'll need to bring in a tea towel and some mantels for the lantern (although we did leave a stock of mantels at the hut). Sleeps 6 people MAXIMUM. Hut Fee: As of November 2007, a reservation and fee ($10 per person per night) is required for Steed cabin. Reservations can be made on-line at the KMC webpage . Access: Access is via the Munson Road system out of Bombi Summit. Follow the main Munson Road for 24 km to a small pull-out by a tributary of Glade Creek. Bushwhack due east to reach a pass on the south ridge of Siwash Mountain. Descend in a northerly direction to reach the hut. History: Built by the KMC in 1996 to 1997 in memory of the Steed's (father and son) killed in an avalanche in Kokanee Glacier Provincial Park. Did my annual KMC Bonnington Traverse over April 3 to 6 and found essentially no wood left at Steed Cabin. There won't be any now until the summer work parties get in. The KMC recently had their annual work party to the Steed Hut and we have now supplied a two burner Coleman white gas stove (bring your own white gas), as well as dishes, cutlery, pots, etc. There is a washing up tub with some detergent and bleach. Please pack all the eating utensils back in the tub to keep the critters out. You'll need to bring in a tea towel and some mantels for the lantern (although we did leave a stock of mantels at the hut). There is not much wood left at the cabin (unless some of it is buried under snow). Hut is clean and in great shape. There were snowmobiles touring around the area and at the hut. They seemed to like high-pointing around on some of the steeper slopes (regardless of the fact that the avalanche hazard was considerable). Heli-ski operations were also making use of the area for turns. 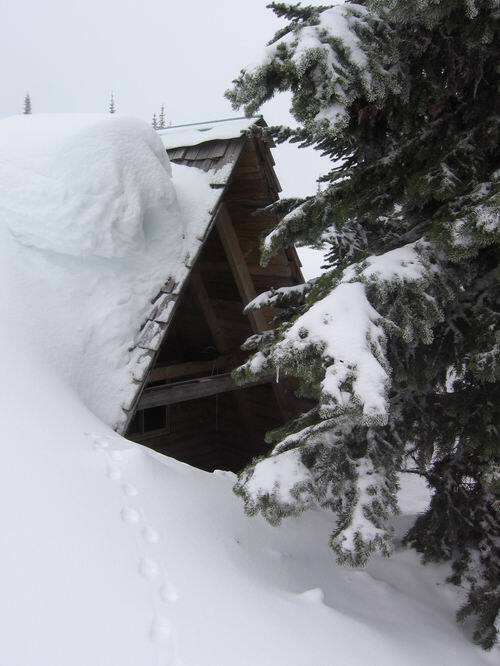 240 cm of snow at the cabin and the outhouse took a lot of digging. As usual, the ski tourers are using up a two year supply of wood in one year. If you stay at the cabin, use the wood SPARINGLY. It is only for overnight stays and what is there has to last 2 to 3 years. The KMC is desperate for donations to help with maintenance so don't be a cheap skate, send us $10/per person/per night.